April 11, 2019 -- Long trips to space may affect an astronaut's health in a number of ways, from metabolism and gut bacteria to how their immune system works. But these changes appear to be mostly temporary, according to a first-of-its-kind study of identical twin astronauts, information that is helping NASA plan for manned missions to distant planets, like Mars. 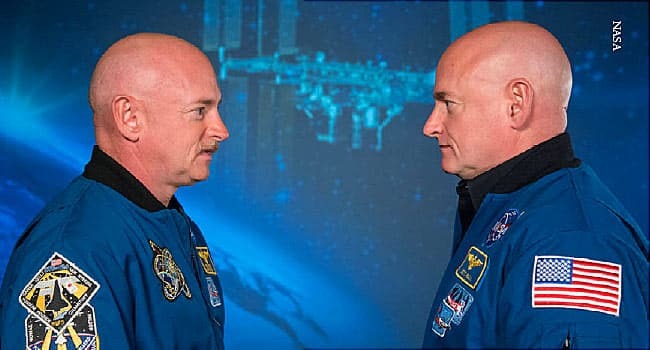 Brothers Scott and Mark Kelly were 51 in March 2015, when Scott began his fourth and longest space mission -- commanding the International Space Station (ISS) for 340 days, which set an American record. Mark, a retired astronaut who is married to former U.S. Rep. Gabrielle Giffords and is running for a U.S. Senate seat in Arizona, remained on Earth. By comparing the two men, who share the same genes, researchers were able to see -- down to the DNA -- what changed as Scott endured the stresses of space travel. Scott is one of only four astronauts to have ever spent so much time in space. The study revealed how Scott’s body changed in space. While most of those went back to normal after he returned to Earth, some have persisted for at least 6 months after his return -- including changes to his eyes, to his mental abilities, and even some chromosomal damage. Before, during, and after the mission, the men were given an array of tests. For the first report, researchers collected 317 biological samples including stool, urine, and blood. The brothers also had their physical and mental abilities regularly measured. Some of the changes were relatively easy to explain. As Scott ate a carefully controlled diet and exercised regularly on the ISS, he lost about 7% of his body weight. Mark, who was able to eat whatever he wanted and drink alcohol, which is forbidden on the space station, gained a few pounds -- about 4% of his starting weight. One piece of good news is that most of the things that changed during Scott’s stay at the ISS -- including his gut bacteria, gene expression, immune function, and metabolism -- were back to normal within 6 months of his return to Earth. A fun fact: Vaccines seem to work just fine in space. Scott got his flu shot while on the ISS, and his immune system responded much as Mark’s did. Mark got his vaccine at the same time, just back on Earth. But other changes have persisted after Scott’s mission, and researchers say it’s hard to know what they might mean. Scott’s telomeres changed in space. Telomeres are protective caps -- researchers liken them to the plastic handles on jump-ropes -- that prevent chromosomes from becoming frayed or damaged. Each time our cells divide, our telomeres get a bit shorter. Longer telomeres generally mean a longer life. In space, Scott’s telomeres got longer. But within days of his return to Earth, they shortened again. “There was a very dramatic shortening of telomeres and that he continued to have, to carry more short telomeres after flight than he had before,” Susan Bailey, PhD, said at a news conference on the findings. She is a professor of radiation cancer biology and oncology at Colorado State University. “So perhaps that’s more of the long-term kind of consequence that at least they need to be somewhat aware of,” she said. In their analysis, researchers divided the changes they saw into three levels of risk: low, midlevel, and high. Scientists flagged Scott’s telomere shortening as a complication of space flight that is a midlevel risk. Other changes were flagged by researchers as higher risk to astronauts. Those include eye problems NASA has dubbed spaceflight-associated neuro-ocular syndrome, or SANS. About 40% of astronauts have had SANS. Scott has had it more than once. During spaceflight, the optic nerve may thicken. The globe of the eye can flatten, and the layer of the eye that carries blood to the retina can fold or bunch up, distorting vision. Some, but not all, of those changes return to normal on Earth. But they can also get worse the more missions an astronaut completes, as was the case with Scott. Researchers think these changes happen because in the weightless environment, about 2 liters of fluid rushes from the legs to the head and stays there for the duration of the mission. In addition, Scott’s carotid artery, the large vessel that supplies blood to the brain, became thicker during the flight. This potentially raises his risk for a stroke, researchers say. Finally, while brain tests performed by the brothers showed no differences in speed or accuracy in thinking during the spaceflight, Scott had significant declines in his mental abilities after landing back on Earth. Scientists say this could be explained by the increased radiation he was exposed to during the flight. NASA calculated that Scott got a dose of radiation on the space station that’s equal to about 50 years of background radiation on Earth. Other concerns flagged by researchers involved Scott’s genes. He had changes in the ability of his chromosomes to repair themselves and more copying mistakes than his brother had, and some of those changes have persisted over time. It’s not clear what they might mean for his long-term health. The researchers are cautious. They say the small sample size -- just two people -- limits their ability to draw broad conclusions about what they’ve found. They also say they can’t be sure whether the changes they documented were due to spaceflight or something else. Experts say the Twins Study has provided unique and valuable information about what happens to humans in space. “The Twins Study demonstrated on the molecular level the resilience and robustness of how one human body adapted to the spaceflight environment. This study was a steppingstone to future biological space research focusing on molecular changes and how they may predict health and performance of astronauts. It opened the door to new research strategies that are already being advanced in other studies,” Jenn Fogarty, PhD, chief scientist at the NASA Human Research Program, said in a news release. Cmdr. Scott Kelly, retired astronaut, participant in the NASA Twins Study. Susan Bailey, PhD, professor, radiation cancer biology and oncology, Colorado State University, Fort Collins.